With the B-600TiFL you get a first-class teaching microscope. The teaching microscope boodles by best quality and an extremely long life time, which you can get to a favorable price. 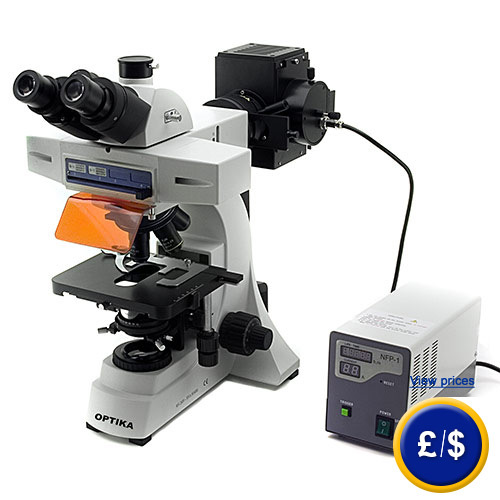 Because of this unbeatable cost-performance ratio the teaching microscope is at best able for applications in all labor- and educational establishments. Among the attractive optic the teaching microscope has also an excellent mechanic quality. The three ocular at the head rotates around 360° in both directions. So you can find quickest possible the correct approach for your individual analysis. In addition it is possible to conform the diopter and the eye distance to have the best view. If there are any questions about this teaching microscope, please have a look at the technical specification below or call: UK customers +44(0) 23 809 870 30 / US customers +1-410-387-7703.. Our engineers and technicians will gladly advise you regarding the teaching microscope or any other products in terms of regulation and control, or scales and balances of PCE Instruments. Rack and pinion mechanism, with coaxial coarse and fine control knobs. Fine adjustment graduation 0.002 mm. Vertical movement range: 20 mm. Tension control on right side; upper stage drive stop on left side. Centrable Abbe condenser with double lens. N.A. 1.25. Fitted with iris diaphragm, blue filter and filter holder. Height adjustment by a rack and pinion mechanism. Illumination External 12V/50W with halogen bulb, fan-cooled case, centering system. Field diaphragm. Full Koehler system. HBO 100W high pressure mercury bulb for epi-fluorescence. B (FITC) and G (TRITC) filtersets. 4-position sliding selector for additional fluorescence.